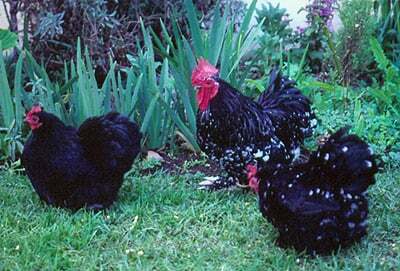 Pekin is the name used to describe the Cochin in Europe and the Far East. The European standard lists them as Pekins. Many of the European colors are not recognized in the U.S. This photo sent courtesy of Graham Duncan of South Africa. According to the Poultry Club of Great Britain, these hens are a very good type for the breed, while the rooster is "a bit leggy."